If you enjoy greeting and assisting shoppers from all over the world, including some famous people, and meeting American Indian artists, the Heard Museum Shop is where you want to volunteer. When visitors walk into the shop, which is often their first exposure to American Indian culture, Guild volunteers are there to answer questions. “Yes, it is real turquoise, certainly handmade by an American Indian artist, and definitely purchased directly from the artist by our Shop Manager or his staff.” The shop is an interesting, exciting, and educational place to volunteer. 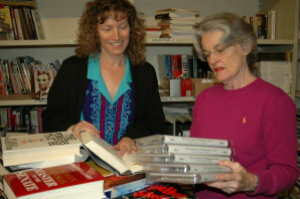 Volunteers work alongside experienced and knowledgeable Museum staff, who share their expertise with both volunteers and customers. 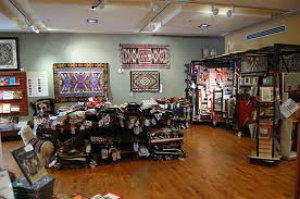 The Heard Museum Shop features the finest, authentic, American Indian handmade jewelry, beadwork, textiles, pottery, katsinas, paintings, sculpture, and baskets. There are artists in every field who exemplify the best of the best and who have proven seminal in influencing future generations of artists and art styles. The Heard Museum Shop is proud to present Bruce McGee’s Collector’s Room, a new gallery space showcasing a carefully selected group of works by the top names and most influential artists in Native Art, past, present and future. 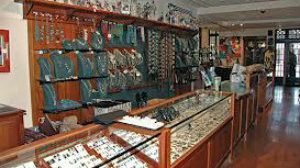 The Guild established the very first Heard Museum Shop at the Central Avenue location in 1958. Although the shops are now under professional management, volunteers continue the vital role of greeting customers and helping them make selections. This is important work because the shops are a major source of income for the Museum. Museum Shop volunteers are needed every day of the week. Morning, afternoon, and swing shifts allow volunteers to choose their own hours. A four session training program prepares workers for their duties. Throughout the year, workshops are held to keep volunteers up-to-date on merchandise and policies. Guild Members Contact the Museum Shop Chair at shop@heardguild.org for complete information.